Here's a fun idea for the summer party scene: fruit tapas! This is spruced up fruit. 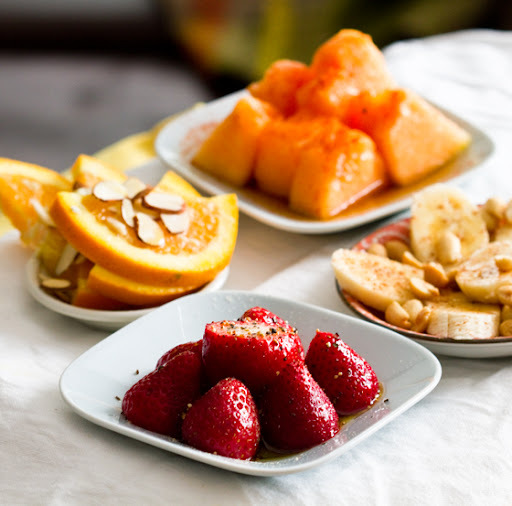 Think Pepper-Balsamic Strawberries, Cayenne-Maple Cantaloupe and Almond Oranges. And more. We all love crunchy veggie appetizers, well lets give fruit a spruced up look. You always see the "fruit platter" looking so bare and - a little boring. Punch up the fruit flavors with subtle ingredient accents like spices, oils, vinegars, herbs and more. This fruit tapas idea is especially cute for summer brunch parties. Give these snazzy recipes a try and get inspired to dream up your own fruit tapas ideas. Mint and wasabi marinated apples? Brown sugar and cinnamon soaked peaches? Grilled apricots soaked in vanilla and olive oil? So many ideas. Can you think of any?? Get my fruit tapas recipes here! I like to use exotic sugars, vinegars, acids like lemon and lime, spices like cinnamon, cayenne, pepper, sea salt – nuts, seeds, oils and more! Fruit is a beautiful sweet canvas to play with. Check these out..